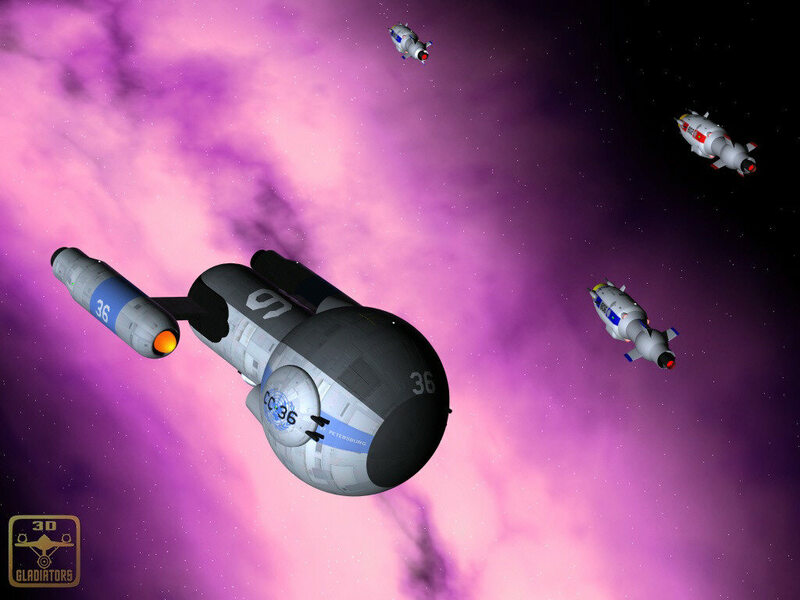 The first Klingon warships to carry matter/antimatter (M/AM) reactors were the D3 cruisers, introduced in 2183. These ships were based on the earlier fusion-powered D2 cruisers but had their "necks" and "shoulders" lengthened some 20 m to accommodate the new reactor. The similarity of the Klingons' first-generation reactor to early Earth reactors suggests that Klingon engineers closely studied Earth designs, particularly those of the second-generation SSWR-III series introduced in the 2150s. 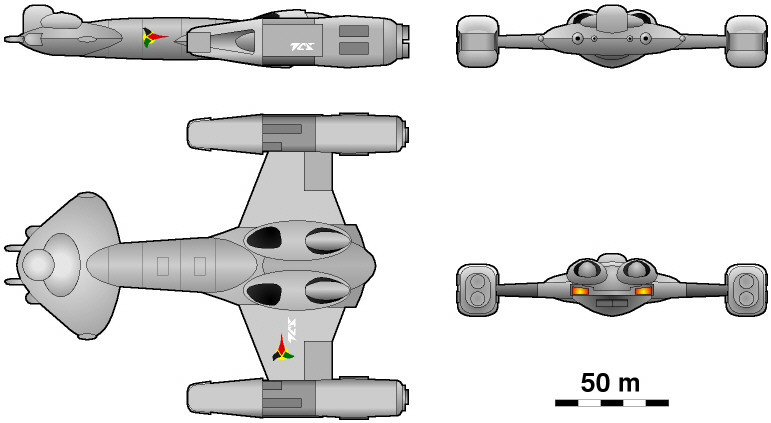 By the mid-2170s, reactors of this type had become standard for even merchant vessels within the United Federation of Planets (UFP), so the Klingons would likely have had little trouble acquiring M/AM reactors and reverse-engineering them. 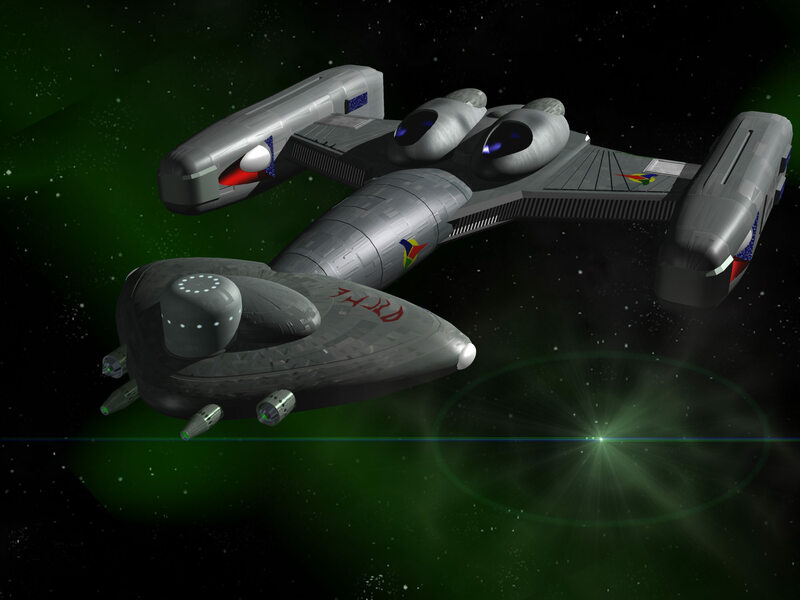 However, unlike the first Earth warships to carry M/AM reactors (Krechet class, 2157), the Klingon D3 also carried a full-sized deuterium-fueled fusion reactor, similar to that carried by the earlier D2. Either reactor could be used to achieve warp speeds. Because the first-generation Klingon reactor carried by the D3 functioned reliably for only short periods of time, it was used instead of the fusion reactor to boost maximum speeds during combat or emergency situations. Most interstellar travel still relied solely on the fusion reactor, which was now handicapped by the dead weight of the unused M/AM reactor and decreased deuterium stores. Performance at sublight speeds was similarly degraded by the additional weight. This Klingon practice of equipping ships with dual or parallel power sources was due to several factors. First, early Klingon reactors were extremely unreliable and often broke down or malfunctioned, occasionally with tragic results. Perhaps the Klingons simply had a poor understanding of the fundamentals of M/AM reactor design and operation, as they had acquired M/AM technology rather than developed it independently. Even when the warp drive was operated within a strictly limited performance envelope, the M/AM was highly prone to breakdown and malfunction. At least five D3 cruisers are known to have been destroyed by catastrophic M/AM reactor malfunctions, most likely core breaches. A second factor was the relative lack of urgency with which the Klingons were able to develop this new power source. Unlike the United Earth (UE) of the 2150s, the Klingons were not locked in a struggle for survival with an aggressive, faceless foe. Instead, the Klingons themselves were seeking to expand their area of dominance and did so at a pace they determined. Therefore, the Klingons had the "luxury" of gradually introducing M/AM reactors in their ships alongside fusion reactors. In contrast, the wartime UE Stellar Navy (UESN) needed to field large numbers of technologically superior ships as quickly as possible and, therefore, had no choice but to introduce M/AM reactors in a fully mature state, i.e., as a ship's sole power source for warp flight. Indeed, parallel reactors were carried only when absolutely required. The last major Earth-designed warships to carry dual power plants were the Yorktown-class strike carriers (introduced in 2158), which often operated independently deep within enemy territory. In the unlikely event that its main M/AM failed, an unescorted Yorktown could still return to UE space at moderately high warp speeds by means of its fusion reactor. Despite its significant shortcomings, the D3 did give the Klingons valuable experience in operating and maintaining M/AM reactors under service conditions, experience that would prove valuable in the coming years when the Klingons began to exploit the full potential of M/AM power systems. Soon after the D3 cruisers entered service with the Klingon fleet, they were involved in numerous engagements with Romulan warships along their mutual border. These engagements ranged from intelligence raids by single ships to large-scale fleet actions that could be considered invasion attempts. However, because this relatively primitive M/AM reactor provided little, if any, performance advantage over late-model fusion reactors, the political objectives of these missions were rarely met. Furthermore, the battle-hardened Romulan fleets, which had defended against superior UE-Andor alliance forces for four years, usually had little trouble blunting the attacks of the Klingons and their primitive M/AM-powered ships. Because Klingon M/AM reactors were unreliable and could only be used for the terminal attack stage of any mission, Klingon ships could usually be detected by long-range Romulan sensors and intercepted long before the terminal stage was reached. 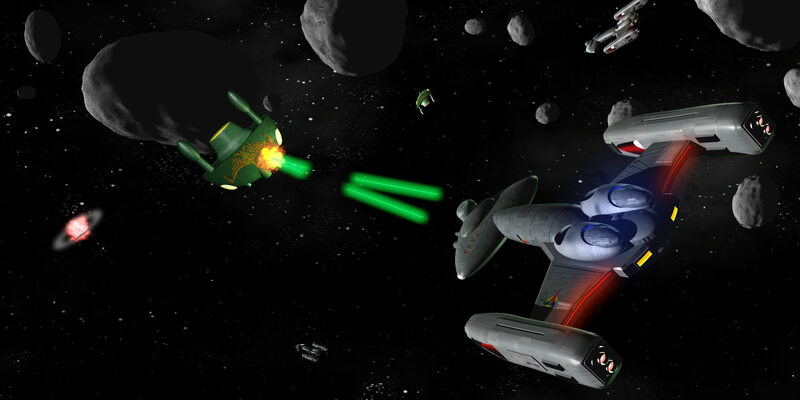 In addition, Klingon weapons, mostly early disruptors and atomic-tipped missiles, were no match for corresponding Romulan weapons, much less for the recently introduced Romulan plasma cannon, which, when combined with Romulan cloaking systems, would prove to be dangerously effective well into the late 23rd century. Klingon attacks did have some success when a significant numerical superiority could be established across a small section of the frontier. For example, in 2192, a squadron of six D3s attacked a Romulan sensor/defensive station within an asteroid in the Omega Chottag system. Celebrated in the Klingon archives as the Battle of Geshto, this attack involved the Klingon ships approaching the target under M/AM power at wf 3.9 from an unusually long distance of 5,000 au or about 0.08 ly. The strain of operating the M/AM reactor at maximum output levels for almost 12 hours proved to be too much for two of the attacking ships, which were destroyed by warp core breaches when their requests to break off their attack runs were denied despite their reactors' showing dangerous signs of stress. One of the four surviving ships was destroyed by a bolt from a Romulan plasma cannon guarding the base just as it began its final attack run, but the three other ships succeeded in firing volleys of missiles. Two of these missiles struck the base, which was neutralized and temporarily occupied by Klingon troopers before superior Romulans forces arrived to drive them out. For the loss of three ships and more than 1,000 crewmen, the Klingons forced the Romulans to be without long-range sensor coverage in this sector for approximately two months, until a specialized sensor ship could be dispatched. However, this time was much too short for the Klingons to exploit the breach with a follow-up attack.